We offer you our visa support (invitation letters) for Russian visa. We can assist you in getting tourist and business visa to Russia. It means that we can arrange for you the invitations for these two types of visa – Tourist Russian Visa and Business Russian Visa. To enter Russia foreigners need to obtain a Russian visa. To get a Russian visa an invitation is required. In cases when Russian visa is not required (for the people of the countries which have a special agreement with the Russian Federation) in some cases only the invitation is required or you can enter Russia just showing your passport. But you’d better check everything with us or with your local Russian consulate before your trip to avoid the problems on the border. You can see the list of the countries that do not require visa for Russia. Our travel company is registered in the Russian Federal Tourist Agency (‘Rosturizm’) and authorized by the Ministery of Foreign Affairs of Russia (MID) – and thus we can oficially make the invitations for Russian tourist visa. Also we assist in getting business visa invitations for those who come to Russia on business: consulting, negotiations, industrial & trade exhibitions, etc. 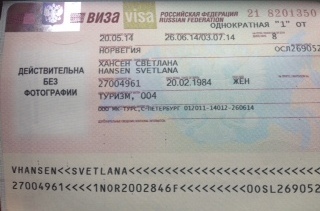 Russian visa is a special paper pasted in your passport that let you stay in Russia for a certain limited period (see the photo with the example of a tourist Russian visa).The dates of your trip to Russia as well as your passport data are indicated in the visa, and might contain your photo. The dates of your trip comprise the dates of your entry and exit to/from Russia. Date of your entry is the date of your possible entry to Russia – you can’t enter Russia before this date, but you can enter Russia right on this date or later! And the exit date is the date of your possible exit from Russia – you can’t leave Russia after this date, but you can leave Russia before this date or right on this date! Visas to Russia can be issued only by Russian Consulates or Embassies. We are not able to provide you with the visa – we can only supply you with the invitation letter that is required for getting Russian visa. All Russian Consulates and Embassies are located out of the territory of the Russian Federation (in other countries), so in Russia it is not possible to make a Russian visa. To apply to a Russian visa you should go to the Russian Consulate in your country or in the country of your temporary or permanent stay (if you have a permit to apply for a visa there). To know and understand where (in which cities and towns of the world) it is possible to apply for a visa to Russia, please see the Russian Federation consulate locator. The required documents for getting visa to Russia are the invitation letter, your passport, consular questionnaire (filled in and signed), passport size photos, etc. Please, check the complete list of the documents at your local Russian Consulate as in each country or even in each city the rules can be different. Russian visa support (invitation) can be of different kinds: tourist visa, business visa, work visa (work permit), private visa, study visa, event visa (cultural connections, humanitarian, sport, etc. )We can make for you a tourist visa invitation or a business visa invitation. Also we can arrange tour-tickets (special documents that serve instead of visa) for cruise-ship tourists who come to Russia in a cruise ship and stay not more that 72 hours.